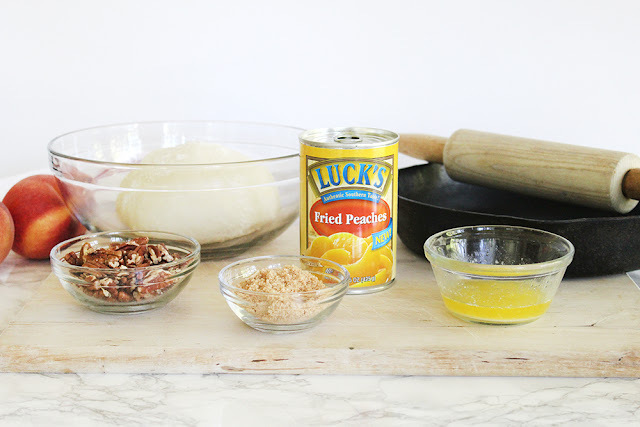 This post is sponsored by Luck’s and I received products to facilitate a recipe. All opinions are my own. 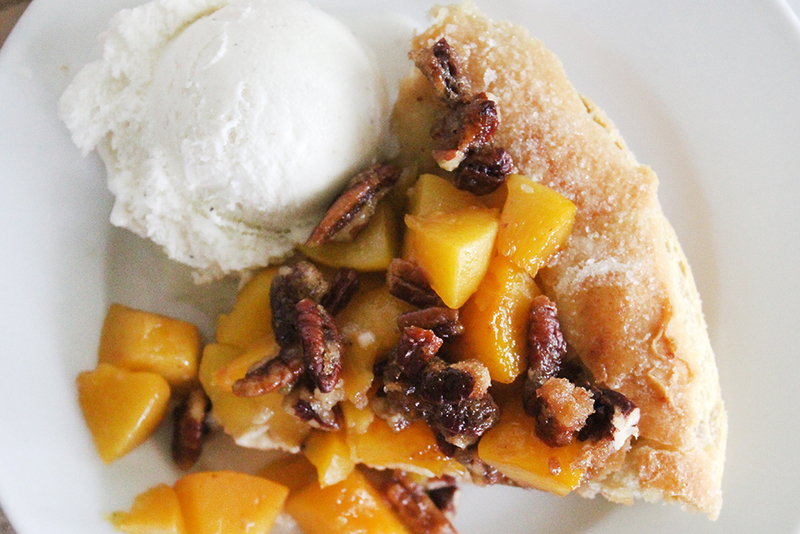 There is nothing more southern than a dessert that features peaches and pecans. They're some of my favorite foods and when you add them to a sweet dough, they are divine. Ah, carbs. 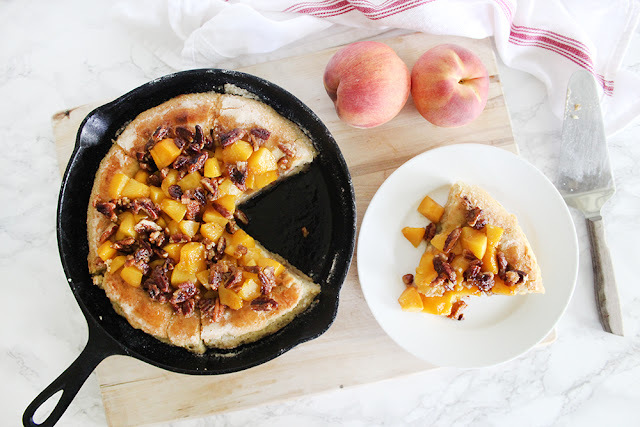 Today's recipe is a southern dessert delight: a Fried Peach Dessert Pizza. 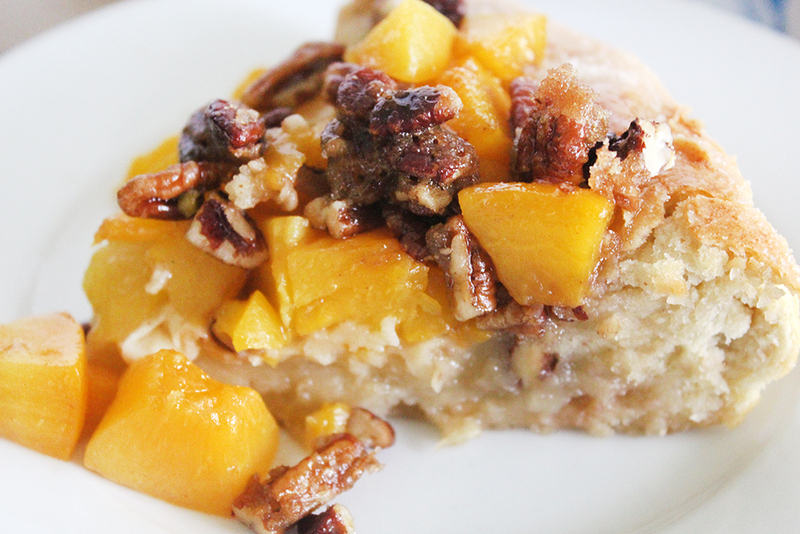 Topped with crunchy brown sugar pecans, it's a real treat! It's easy and the dough can be made ahead of time and refrigerated or even frozen until you need it. 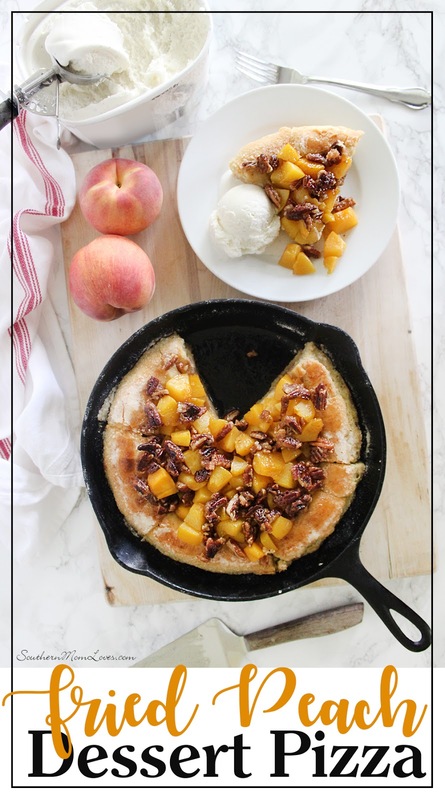 When it's time for dessert, simply pre-bake your crust, then add luscious fried peaches, brown sugar and butter-soaked pecans, then sand the edges with sugar for a delicious caramelized sugar crust. The result is delightfully fruity, sweet, crunchy, and chewy and is perfect with a scoop of vanilla bean ice cream. I love to create new recipes and the easier, the better. Canned foods can help busy moms make wow meals, fast, and Luck's is a familiar staple in the south. 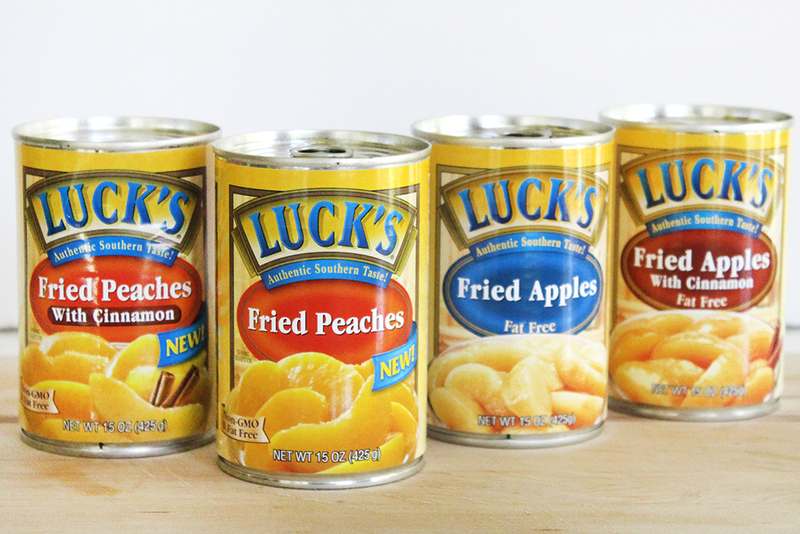 Luck's has been delivering authentic southern taste in premium quality beans and fruits since 1947. They're an easy way to make great-tasting meals, side dishes and desserts. Check out more recipes here, then grab a coupon here. I love being able to be creative with my cooking without all of the peeling, slicing, and pre-cooking, so let's get to this easy and delish dish! A note about the dough: I used the entire recipe in one thick-crusted dish, but if you like a thinner crust, you can use half of the dough, wrap the remainder well, and freeze until the next time you'd like to make it. 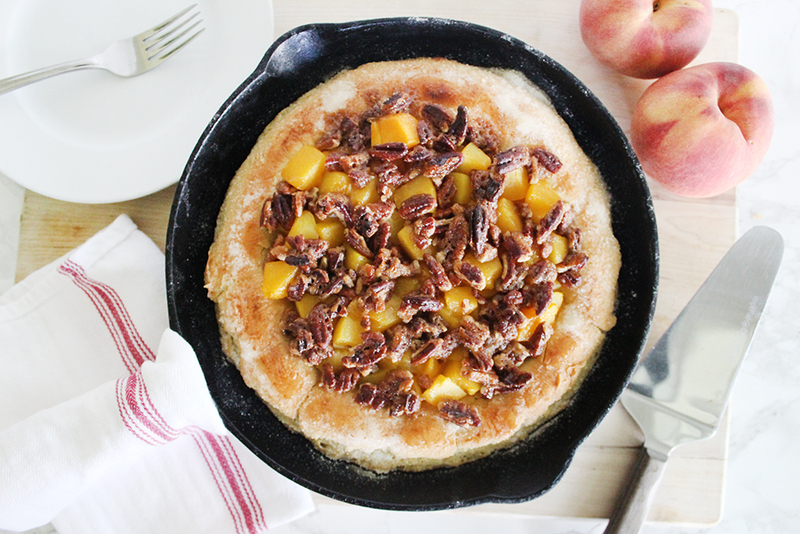 This pizza would be delicious with their Fried apples, too! 1. Make the dough at least 2 hours ahead of time. Combine all of the ingredients except the flour in a large bowl. Mix well, then add in the flour and mix until combined. I mix it with a butter knife and use it to cut the dough while I mix. It's a great way to combine everything while keeping your hands clean. :) Cover with plastic wrap and allow to rise until doubled in size, about 2 hours. Once risen, you can use it immediately or stick it in the fridge until needed (it will keep for a few days) or wrap thoroughly in plastic wrap and a freezer bag and freeze for up to a month. If freezing, allow to thaw completely in the fridge before using. 2. Pre-heat your oven to 400° F.
3. Dust your dough with flour and knead it into a ball. It will be sticky! Roll out your ball into a large circle a little bigger than your pan. 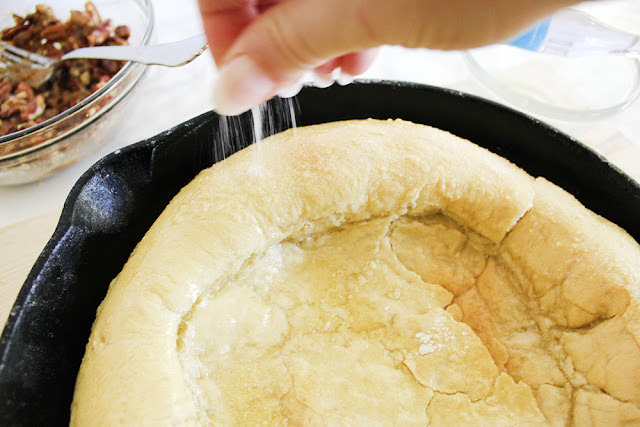 Drape the dough over your pan and allow it to hang over the sides for a few minutes. 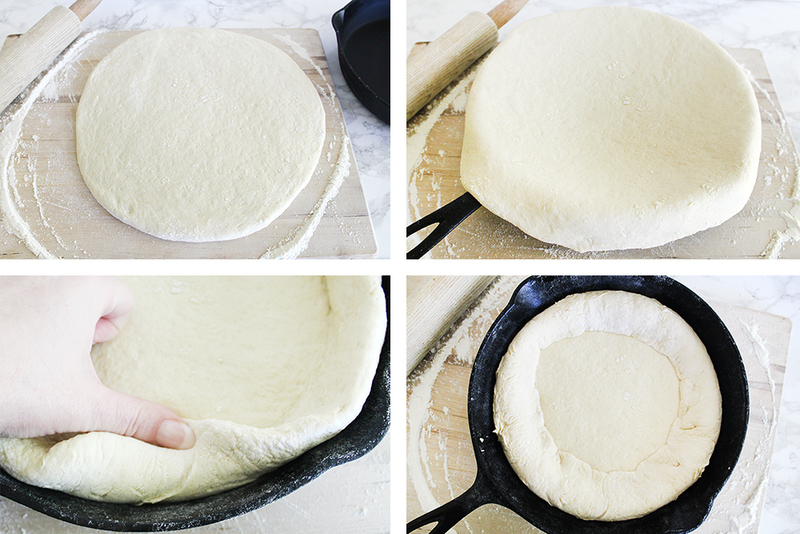 This will stretch your dough and keep it from shrinking up while it cooks. :) Fold the outer edges inward to form the crust edges and bake for 15-20 minutes for thinner crusts or 20-25 minutes for thicker crusts, just until the crust is cooked through and a light, golden brown. 4. 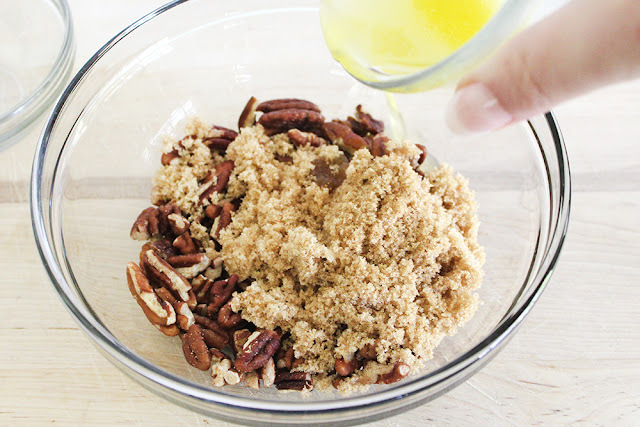 In a small bowl, mix together the pecans, brown sugar, and 2 tablespoons of the melted butter. 5. 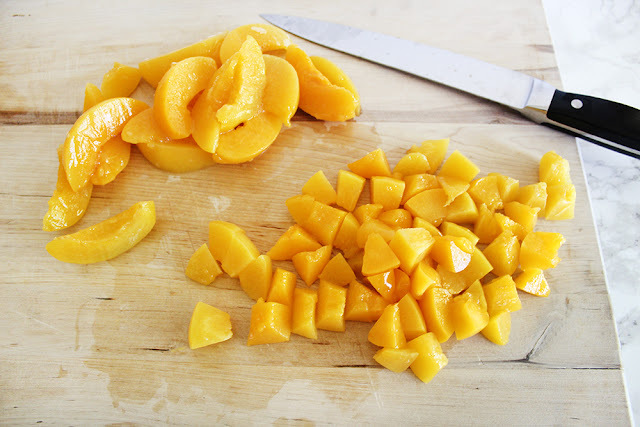 Chop your drained peaches into smaller pieces. 6. 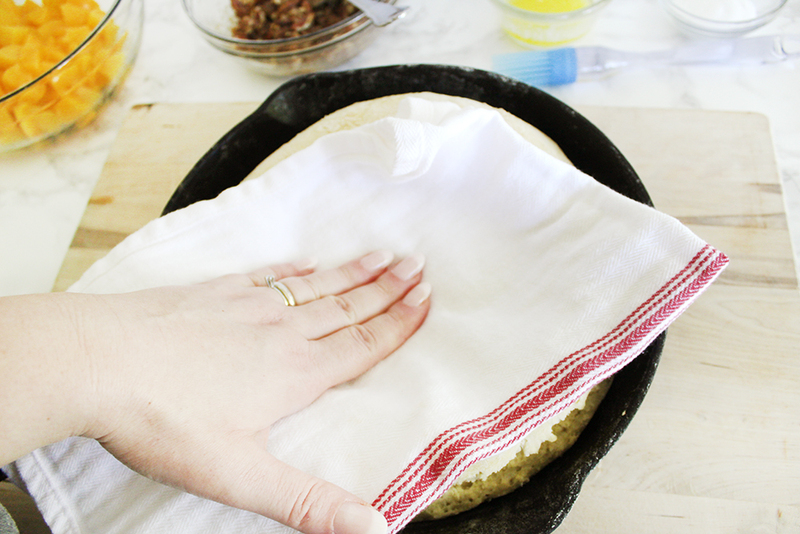 If your crust is too puffy when it comes out of the oven, you can press it down using a clean tea towel. 7. Use the last 2 tablespoons of melted butter to brush completely over the crust, then sprinkle the granulated sugar over the crust edges. 8. 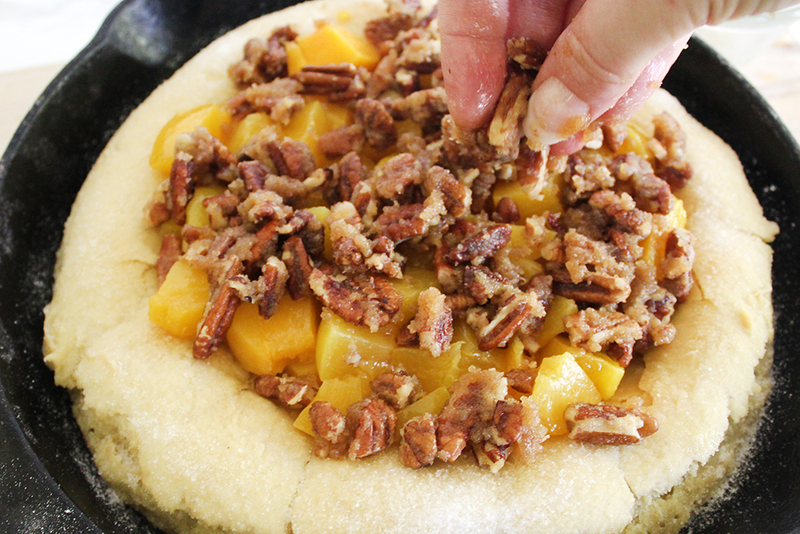 Fill the center with the chopped peaches and sprinkle the pecan mixture on top. 9. Bake for an additional 10 minutes to heat it up, then broil for 3-5 minutes until the sugars are well-caramelized. 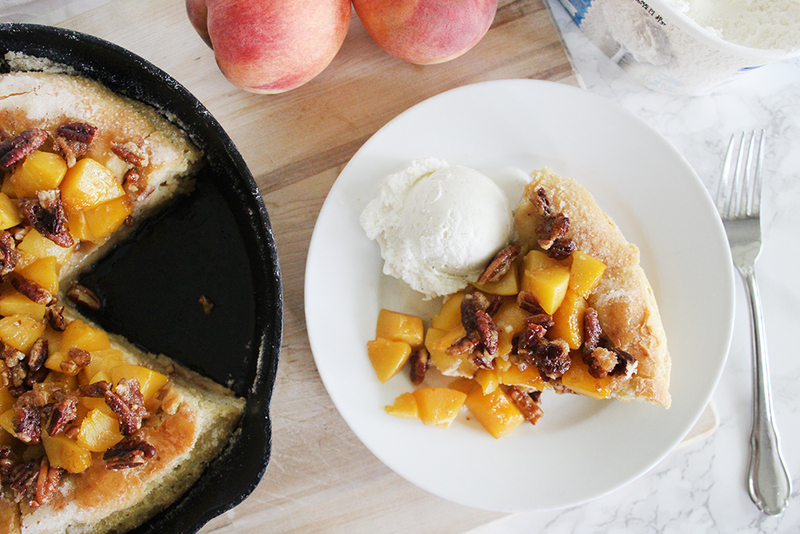 Your delish fried peach pizza is ready to eat warm, right out of the oven! Don't forget the ice cream! Vanilla is a wonderful pairing with these flavors. Enjoy! 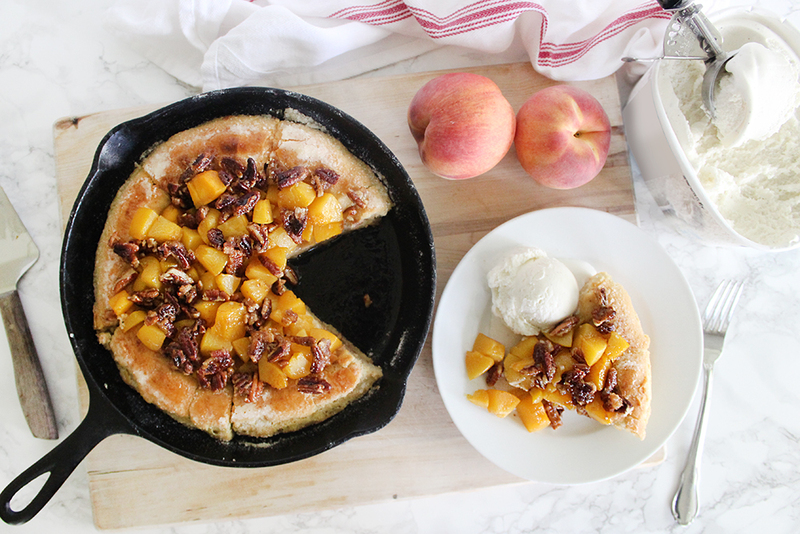 Have you ever had a dessert pizza? Will you be making this one? I love to read your comments!